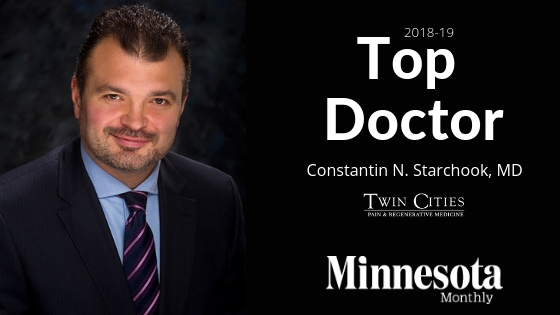 Twin Cities Pain and Regenerative Medicine is happy to announce that our Medical Director, Dr. Constantin Starchook, has once again been named a “Top Doctor” in the state by Minnesota Monthly Magazine. This is the fifth consecutive year that Dr. Starchook has received this prestigious honor from one of the state’s most recognizable and trusted publications. Being named a Top Doctor by Minnesota Monthly Magazine is a considerable honor because of how the awards are selected. According to their website, Minnesota’s Top Doctors are nominated and voted upon by their peers. Dr. Starchook is a board certified anesthesiologist specializing in Interventional Pain Management and has been practicing medicine for nearly 20 years in the Twin Cities. He performed his residency at the University of Minnesota and has performed thousands of spinal injections in his career. In addition to his work in Anesthesiology, Dr. Starchook has also become a leader in stem cell therapy in the Twin Cities, and throughout the entire upper midwest. Dr. Starchook treats back pain, knee pain, shoulder and joint pain with stem cell therapy. Dr. Starchook is now accepting new pain management patients and those seeking stem cell treatment. To schedule an appointment with one of Minnesota’s Top Doctors, simply call our office at 952-831-7246.